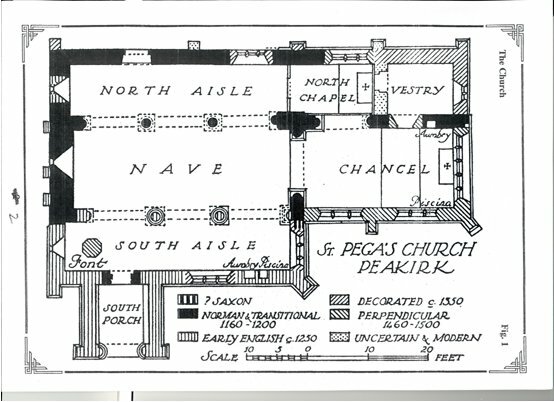 Plan of the church showing phasing. Note the Anglo-Saxon Fabric in the corner between the south aisle and the chancel; probably early 11th century, part of the original small aisleless nave, and the earliest fabric in the church. 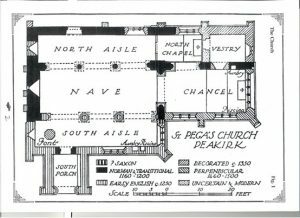 This original church may have had a small chancel, or have had a nave only. The Norman door represents the next phase. The north aisle is also Norman, but the south aisle dates to the 13th century. 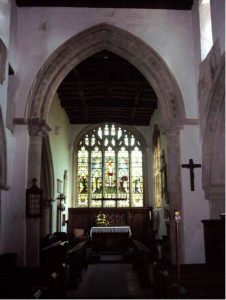 The chancel, which contains Norman fabric and an early 13th century arch to the north chapel, was substantially rebuilt in the 15th century. Anglo Saxon long and short work in the corner between the chancel and south aisle. Tall uprights – the full height of which is visible – alternate with long horizontals, only the square ends of which can be seen. Fragments of the original roof line behind the bell ropes (this can be more clearly seen outside in the west end). 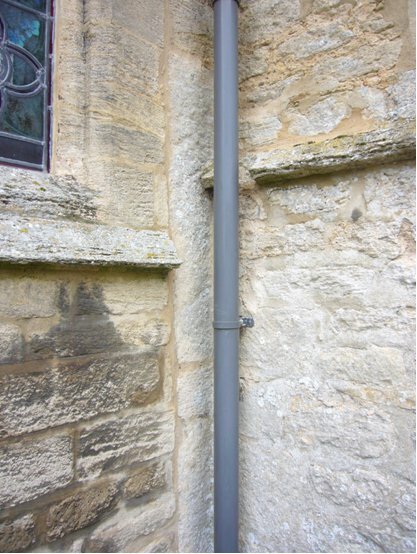 The roof was probably raised and the clerestory added in the late 13th or early 14th century. The wall paintings date to about the early 14th century. The chancel arch. 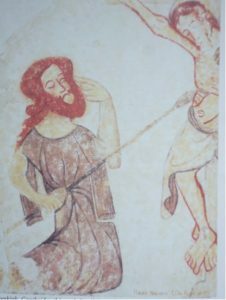 Early 13th century. Note the painted imitation carving on the arch, a zig zag design. To the left is a small door high up in the wall, which would have given access to the rood (the cross above the rood screen) to clean it or cover it, or even to decorate it. The screen separated the nave from the chancel, and this small opening is evidence that there was, before the Reformation, a rood screen at St Pegas. The east window is 15th century, with 19th century stained glass. The stained glass window to the right in the chancel is a memorial erected by the then Rector to his son, Francis Faithful, who died in the First World War. 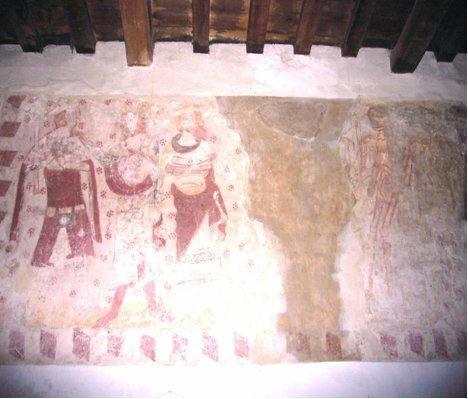 Morality paintings on the north wall. The Three Living and the Three Dead. Their costume suggests that the painting dates to the 14th century. Three magnificently dressed kings out hunting in the forest encounter three skeletons (surrounded by now rather faded emblems of decay, moths and worms). The skeletons say to the kings ‘As you are, so were we; as we are so you shall be. To the left of the Three Living and the Three Dead is another morality painting, a Warning to Gossips. While the painting of the three living and three dead is a popular theme, the gossips are rare. At the time the paintings were uncovered in the 1950s a complete record was made by Clive Rouse, the painting conservator responsible for the work, of which this is part. 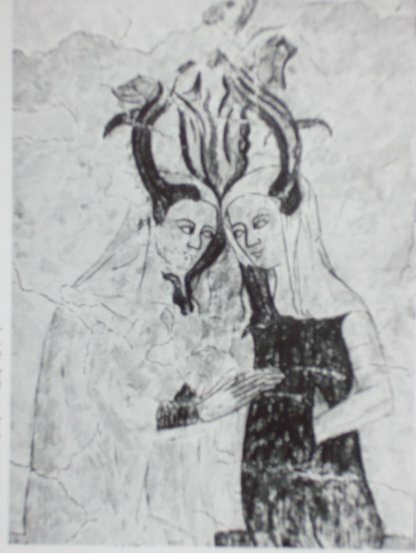 It demonstrates how much they have deteriorated in that time, but you can still just about see the gleam in their eyes (captured so well here) as they enjoy a really good gossip, encouraged by the devil sitting on their shoulders and pushing their heads together. 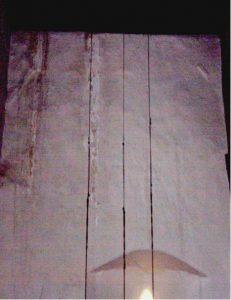 One of the best preserved sections of the Passion sequence above the north aisle, this represents Longinus piercing Christ’s side, for which merciful act he receives the miracle of recovered sight in his left eye, to which his finger points. 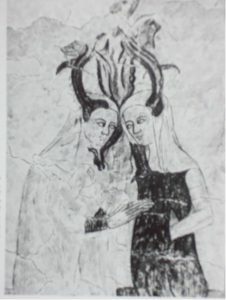 Again, this is part of Rouse’s record of the paintings made at the time they were uncovered. The Passion sequence is in two tiers, to either side of a very faded St Christopher opposite the south door. 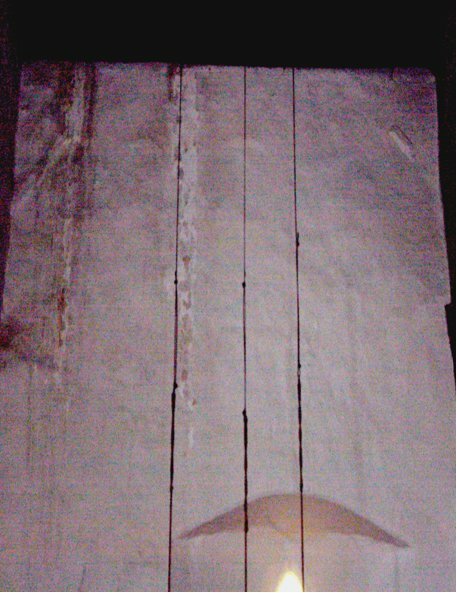 It begins with the last supper, much damaged by damp to the top, and now barely visible. When Rouse uncovered the paintings he treated them with a wax covering, no longer used as a method of conservation; water and salts become trapped behind the wax, causing the paint to flake and deteriorate. In the 1970s the wax was removed from most of the paintings, but remains as a rather grey covering to the left of St Christopher. Finally, a little about St Pega, the saint to whom this church is dedicated, and for whom the village is named. She was the sister of St Guthlac (674 -714 AD), and the daughter of a noble family of the midland kingdom of Mercia. Guthlac was a warrior who abandoned the life of a soldier at 24 to become a monk at Repton, but soon sought a more reclusive life. Hearing of a remote island in the fens where he could fulfil this dream, he made his way to the place now known as Crowland. It’s said that his sister Pega joined him for a while, until he claimed that her form had been taken by a devil tempting him to break his vows and eat before sunset (which perhaps she had done, out of concern for his health and well being). He banished her from the island, so she came to the closest point to Crowland, Peakirk, where she set up her own hermitage, later the site of a small chapel. In the 20th century the chapel and attached house was occupied by two successive communities of Anglican nuns, but is now a private house. Pega never saw Guthlac again, but when he died she was fetched by his servant and taken by boat to Crowland to pray for his soul for three days before burying his body. A year later she left on a pilgrimage to Rome, miraculously restoring the sight of a blind man on the way. She never returned, but died in Rome in 719. 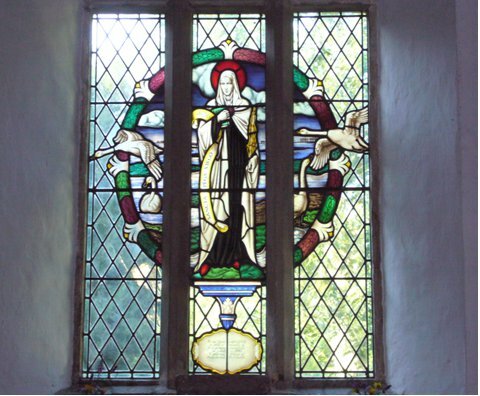 It’s said her heart was returned here and was kept as a reliquary in the church, contained in a heart stone the broken remains of which, smashed by Cromwell’s troops, can be seen in the south aisle window.